Toward - eventually - dollar parity. 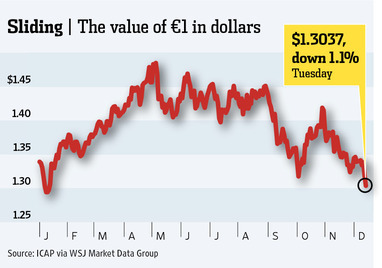 The euro has reached an 11-month low of $1.30, accelerating a trend that has seen the Old World's currency decline 12% from a high of $1.48 in May. As usual, the reasons are many; they include the belief that Europe is headed for a recession if its leaders do not soon restore confidence. European banks are poorly positioned to ease a credit crunch, as their piles of idle cash result from mandated deleveraging and recapitalization. Even the European Central Bank is contributing to euro weakness, based on the expectation of future rate cuts, which typically devalue a currency. Chart courtesy of The Wall Street Journal.